This past week, I had such a good time visiting with David in Portland and going through a box of G.I. Joe’s related photos that he had just found. David gave me yet more info for the book (and I thought I was finished!) and some photos that really fill in some gaps in regard to the store’s growth. We also took a trip up to Longview, Washington, to visit with Bob Schlecht, Sr., who was a close friend of Dad’s from the 1950s till Dad’s passing. 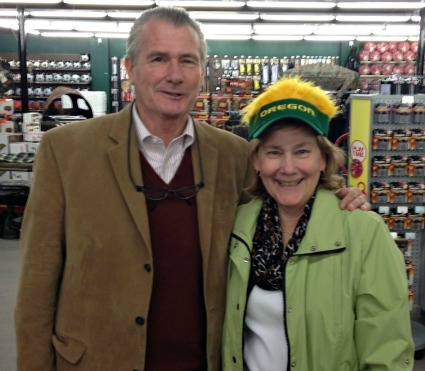 Bob and his wife, Lila, started Bob’s Surplus in 1947 and it has grown and changed into Bob’s Sporting Goods. When Bob retired, his son, Bobby, took over, and now Bobby is retiring and his son, Matt, has taken the helm. And why didn’t you call me???? Would have loved to have coffee or lunch! Nice picture of the two of you.